The winners of the Gary Jacob Memorial SuperFan Awards were announced by NSSN’s columnist Ron Hedger. Amateur Divsion: Kevin Trittien and Deb Roberston, both of Iowa who attended 156 races. Professional Division: Ron Rodda of California, who attended 143 races. The award is named after Gary Jacob, a motorsports journalist from California. He traveled to races at almost every track, week in week out, across the country. He provided an estimated 1,000 articles annually to NSSN. He passed away in 2006 while attending a race. Keep posted for details on submitting information for the 2010 contest. 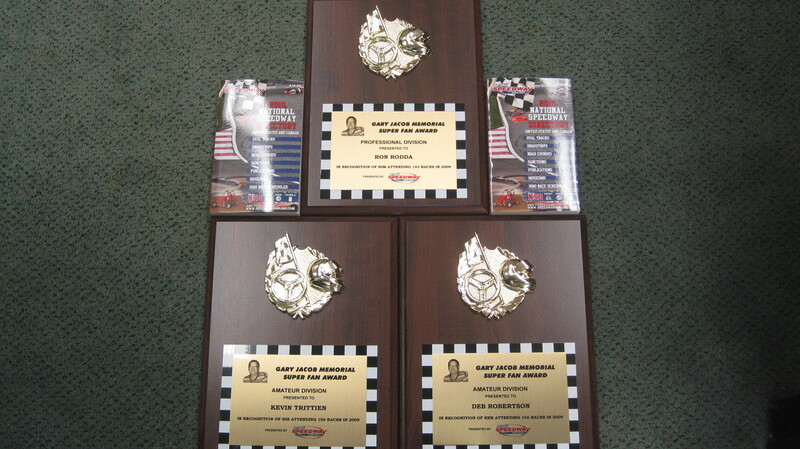 NSD is proud to support this award by presenting plaques made by Classic Trophy, Co. to the winners.